ATLANTA (Dec. 4, 2016) – The No. 1 Alabama Crimson Tide and the No. 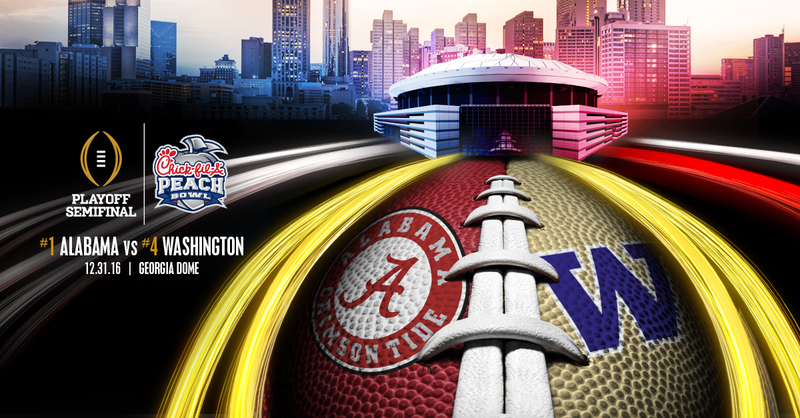 4 Washington Huskies are set to meet in the 2016 College Football Playoff Semifinal at the Chick-fil-A Peach Bowl. The 49th annual Chick-fil-A Peach Bowl will be held on Dec. 31 at the Georgia Dome in Atlanta and will be nationally televised by ESPN. Game time is set for 3 p.m. ET. Alabama (13-0, 8-0 SEC) enters the game as champions of the Southeastern Conference. The Crimson Tide are the defending national champions and have won 25 games in a row under Head Coach Nick Saban, including eight Top 25 wins this season alone. Alabama boasts the nation’s No. 1 defense, leading the nation in a number of statistical categories including total defense and scoring defense. The unit as a whole has contributed 10 touchdowns, which leads the nation. The offensive side of the ball is full of playmakers, led by true freshman quarterback Jalen Hurts, who has accounted for 34 total touchdowns and more than 3,400 yards of total offense. Saban is a previous winner of the prestigious Bobby Dodd Coach of the Year Award as Coach Saban took home the coveted Dodd Trophy in 2014. Washington (12-1, 8-1 Pac-12) enters the game as champions of the Pac-12 Conference. Head Coach Chris Petersen has led Washington’s resurgence that now has them once again competing for a national title. Washington has won 12 games for the first time since 1991 when they won a share of the national championship. Led by Pac-12 Offensive Player of the Year Jake Browning, the Huskies’ offense has smashed school records for points and touchdowns, and currently ranks No. 4 in scoring offense in the nation. On the defensive side of the ball, Washington’s ball-hawking unit leads the nation in turnover margin. Coach Petersen is also a former winner of the Dodd Trophy, having won it in 2010. Alabama leads the all-time series with Washington 4-0 dating back to 1926. They have twice met on a neutral field, including the most recent meeting in El Paso, Tex. in 1986. Fans may still be able to find limited tickets on the secondary ticket market by using the Chick-fil-A Peach Bowl’s official secondary market ticket exchange through Ticketmaster. The only other way to secure access to the game is to purchase one of the few remaining VIP Packages – including tickets and hospitality – from the Bowl’ s exclusive ticket package provider, PrimeSport. Visit http://www.chick-fil-apeachbowl.com/tickets to access the PrimeSport ticket package offers. Peach Bowl, Inc. operates the Chick-fil-A Peach Bowl, the ninth-oldest bowl game in the country and one of New Year’s Six Bowls selected to host the College Football Playoff. In 2014 and 2015, the Chick-fil-A Peach Bowl hosted top nationally ranked teams as assigned by the College Football Playoff Selection Committee. In 2016, the Bowl will host its first College Football Playoff Semifinal. The Bowl has earned a reputation as one of the most competitive bowls in the country, with 54% (26 of 48) of its games being decided by a touchdown or less. Peach Bowl, Inc. has disbursed $150 million in team payouts over its 48-year history and has increased team payout every year since 1996. The Bowl also leads all other bowl game organizations in charitable and scholarship contributions, giving more than $21 million to organizations in need since 2002. Peach Bowl, Inc. also owns and manages the Chick-fil-A Kickoff Game, the Chick-fil-A Peach Bowl Challenge charity golf tournament and is the presenting sponsor and manager of The Dodd Trophy national coach of the year award. For more information, visit Chick-fil-APeachBowl.com or follow us on Twitter at @CFAPeachBowl and find us on Facebook at Facebook.com/ChickfilAPeachBowl.